Our hostel's team have traveled a lot. We know that is not easy to be a backpacker and that's why we do our best to help our guests to enjoy their stay. “Madama sounds like home” is our motto and we live up to this with our large comfy rooms, a warm chill-out area and great staff! Madama is the perfect meeting point between Milan and the travelers. During our aperitivo or our amazing Karaoke you can meet locals and experience the Milanese lifestyle. We also host expositions, handmade/vintage markets, live concerts and much more! Madama Hostel is well connected with the main tourist attractions in city. Piazza Duomo in the city center is only 4 stops away on the metro. 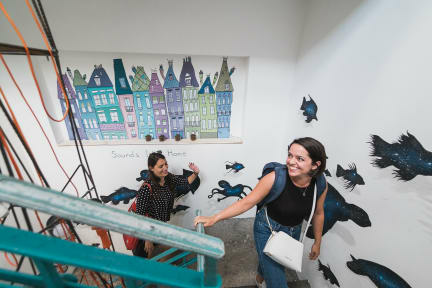 The hostel is also situated in an area with good nightlife. 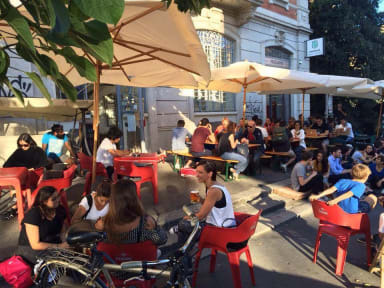 Nearby, 10 minutes by foot, you can find the Porta Romana neighborhood that offers a lot of pubs and bars. Too lazy to walk? Don't worry, just below the hostel there is the Ohibò club which offers music, concerts and much more!! All the rooms and common areas are non-smoking. We were very well received in Madama Hostel and loved our stay there! Always felt comfortable and nothing was missing. It’s super fast to get to the Center of Milano. Totally recommend! Really nice hostel and for sure really good staff they are awesome.